Designed by Oud in 1956 and realized by his son after Oud's death in 1963, this complex consists of a congress portion and a freestanding triangular hotel block. A lobby with a monumental staircase connects the large congress hall and two smaller spaces. Taut, elongated facades sport blue glazed tiles and yellow glazed brick with aluminium window frames. By these means, Oud fixed the colour scheme for all time. 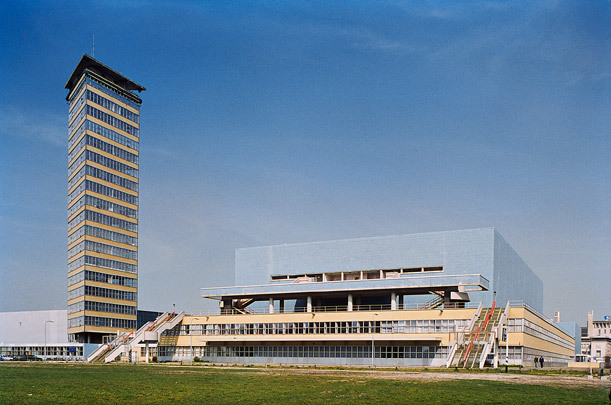 Between 1986 and 1989 the building was enlarged with a column-free hall of 8000 m2 (Statenzaal) and an indoor car park. This hall is to be demolished in 2006 when the concress centre is redeveloped into an international centre for peace and justice, The Hague World Forum. Oud’s free-standing tower has proved difficult to exploit, as evidenced by an unsuccessful bid in 1996 to refurbish it as offices and apartments.